The Townsend 11 collective of award-winning writers is back again with eleven true stories that will delight, entertain, amuse, and inspire readers of all ages. 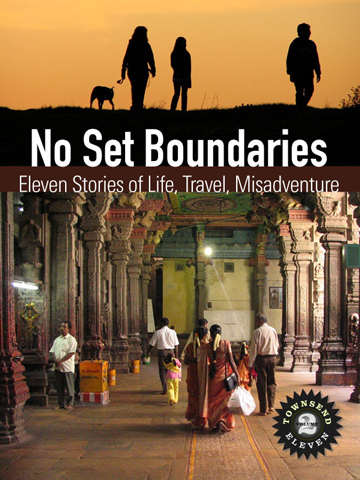 If you like the essays published in Travelers’ Tales, Lonely Planet, and other creative nonfiction anthologies, you’ll love Townsend 11’s second volume, No Set Boundaries. The first volume, No Fixed Destination, took readers from China to Croatia and beyond with heartfelt memoirs, stories of romance, and lessons learned. The second volume moves from reflection to action. Witness an early-19th-century Catalan tradition practiced in modern Barcelona that terrifies and thrills Jennifer Baljko. Follow Bonnie Smetts in Rome as she discovers how to shop the Italian way. Shiver with Dana Hill on a cold beach in England. Watch Carol Beddo find the courage to deal with bureaucratic prejudice aimed at a young woman in Ethiopia. Walk with backpacker Y.J. Zhu along a frightening, war-ravaged Cambodian road into hidden beauty in Angkor Wat. Rest awhile with Jacqueline Collins in a special California garden. And, slide through time with editor Larry Habegger as he drifts into an Impressionist painting on a canal in France. Then prepare to laugh. In his hilarious “Warped Willie,” Bill Zarchy deals with his once-proud, straight zucchini that morphed into a crookneck squash. Barbara Robertson’s attempt to help lost travelers becomes a comedy of misdirection. Whether you want to tickle your imagination, laugh out loud, or come along on an adventure, No Set Boundaries has a story for you.